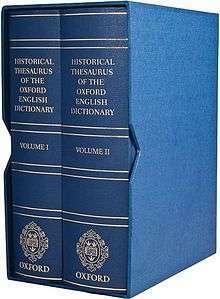 Historical Thesaurus of the Oxford English Dictionary : with additional material from "A Thesaurus of Old English"
The Historical Thesaurus of the Oxford English Dictionary (HTOED) is the print edition of the largest thesaurus in the world, the Historical Thesaurus of English (HTE), conceived and compiled by the English Language Department of the University of Glasgow. The HTE is a complete database of all the words in the second edition of The Oxford English Dictionary, arranged by semantic field and date. In this way, the HTE arranges the whole vocabulary of English, from the earliest written records in Old English to the present, alongside types and dates of use. It is the first historical thesaurus to be compiled for any of the world's languages and contains 800,000 meanings for 600,000 words, within 230,000 categories, covering more than 920,000 words and meanings. As the HTE website states, "in addition to providing hitherto unavailable information for linguistic and textual scholars, the Historical Thesaurus online is a rich resource for students of social and cultural history, showing how concepts developed through the words that refer to them." The ambitious project was announced at a 1965 meeting of the Philological Society by its originator, Michael Samuels. Work on the HTE started in 1965. On 22 October 2009, after 44 years of work, version 1.0 was published as a two-volume set as HTOED. It consists of two slipcased hardcover volumes, totaling nearly 4,000 pages. The HTE, released as version 4.2 in September 2014, is freely available online from the University of Glasgow. ↑ Alexander, Marc; Kay, Christian. "How to Cite". The Historical Thesaurus of English, version 4.2. University of Glasgow. Retrieved 25 October 2014. 1 2 3 "Versions of the Thesaurus". The Historical Thesaurus of English. University of Glasgow. Retrieved 2014-10-24. ↑ "Using Historical Thesaurus Data". The Historical Thesaurus of English. University of Glasgow. Retrieved 25 October 2014. ↑ Hitchings, Henry (23 October 2009). "Historical Thesaurus is a masterpiece worth waiting 40 years for". London: The Telegraph. Retrieved 25 October 2014. ↑ "Home page". The Historical Thesaurus of English. University of Glasgow. Retrieved 2014-10-24. ↑ Crystal, David (2014). Words in Time and Place: Exploring Language Through the Historical Thesaurus of the Oxford English Dictionary. Oxford: Oxford University Press. p. vii. ISBN 0199680477. ↑ "UK | England | Oxfordshire | Forty-year wait for new thesaurus". BBC News. 2009-07-06. Retrieved 2010-04-15. ↑ "Classification". The Historical Thesaurus of English. University of Glasgow. Retrieved 2014-10-22. An oversize, one-page listing of all categories in top three tiers is available for download here. "Search". The Historical Thesaurus of English. University of Glasgow.